While children may begin playing with trains at a young age, it is a long, educational, and fun journey that they take with their train sets. At two years old, many children love objects that fit in their hands (power and control), objects that can be tucked in a pocket (secret treasure!) and will delight in spinning the wheels of the vehicles. At two and a half, many children love the “on and off” placement of the vehicles on the track, intent on fitting the wheels in the grooves. At three, you can start gradually adding track and special pieces. Your child will love a tunnel and a viaduct-the cars can disappear and reappear! At four, a child may begin to discover the track as a puzzle, exploring new ways to lay out designs. At five or six, a child may incorporate switches and supports, experimenting with new configurations and possibilities each time she sets it up. At seven or eight, a creative child will challenge himself with novel constraints, perhaps comparing all the layouts possible with particular pieces of track or comparing all the layouts possible within a fixed border. NUCHI wooden railway, one of our favorite wooden train sets, was created by renowned Swedish toy designer Ingvar Petersson. The name NUCHI was created from his native language meaning “nurturing child”. 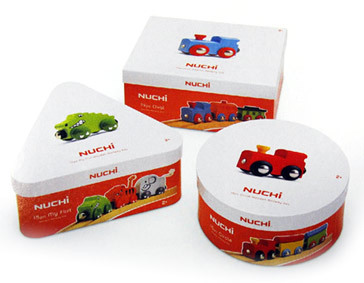 NUCHI wooden railway is made of the highest quality European beech wood – the best choice for solid, safe train track. All track is compatible with other railway brands. 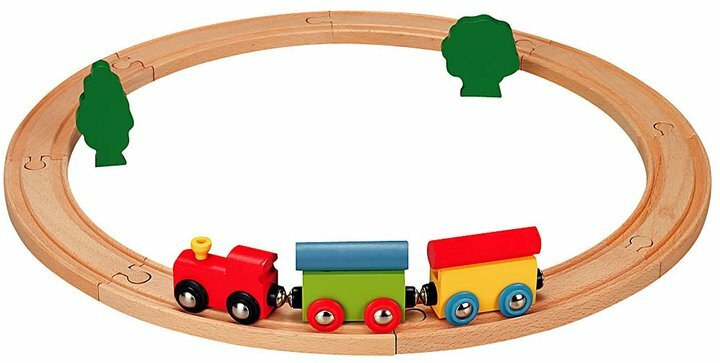 Train cars are connected by rounded magnets on both ends so young children can link all train cars together to make bigger trains. Each time a small set of tracks, new switches or whimsical trains are added to a child’s train set, the variables change and possibilities explode. Quality workmanship with the beauty of natural wood and colorful trains -NUCHI is the perfect toy to explore the fun of learning. Since play is critical to the development of children and the joy of childhood, NUCHI wooden railway is designed to encourage and empower children to take their play wherever their imaginations and their developmental stages steer them. The child is the driver and the toy is the vehicle to take them where they choose to go. Fun and learning go hand in hand and NUCHI wooden railway is the ultimate wooden railway to foster confidence and creativity by empowering your child’s imagination!